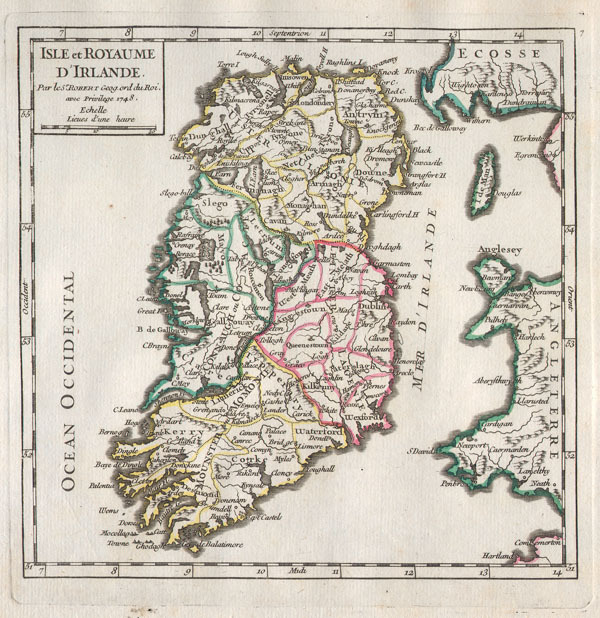 A rare and beautiful 1748 Map of Ireland by the French cartographer Robert de Vaugondy. Depicts the entire island with county and regional subdivisions defined. Beautiful original hand color. This map was originally published in the 1748 edition of Vaugondy's Atlas Portratif Universel et Militaire. Map is dated in the title cartouche. Fine or perfect condition. Wide clean margins. Original platemark. Blank on verso.